Latest LATICRETE® Pro Tips Video! Have you seen the latest LATICRETE YouTube Pro Tips video? These are great tips, in preparation to install tile and stone during hot climate conditions. Questions? Contact your local LATICRETE Technical Sales Rep on 1800 331 012 or email us here for more information. What LATICRETE Products Are all About! For over 50 years LATICRETE have continued to develop products that answer problems which have plagued people for years, and engineer these solutions to be cost-effective, easy to install, and provide years of trouble-free enjoyment. From do-it-yourself to contractor, we develop building products that save time, save money, are easy to install, and deliver consistent and effective results. LATICRETE is proud to offer the best warranties in the industry, giving you peace of mind with high-quality, world-renowned LATICRETE specialised products for waterproofing, crack suppression, sound proofing, floor warming, as well as the worlds greatest adhesives, mortars, grouts, and caulk. However, we believe our best guarantee to be our legacy of more than half a decade of experience with industrial, commercial and residential installations in every imaginable climate around the world! Increased productivity when installing tile and stone. Contact your local LATICRETE Technical Sales Rep by calling 1800 331 012 and discuss our available Systems and Warranties. Talk to us about your upcoming project and how LATICRETE products can save you time, by putting money back in your pocket - or contact us here! Great looking facade, isn't it? The builder from Lamble Building used MVIS on this project, which turns out to be the builders home! MVIS™ Veneer Mortar - click here for more information and watch an installation video. HYDRO BAN® - click here for more information and to view an installation video. 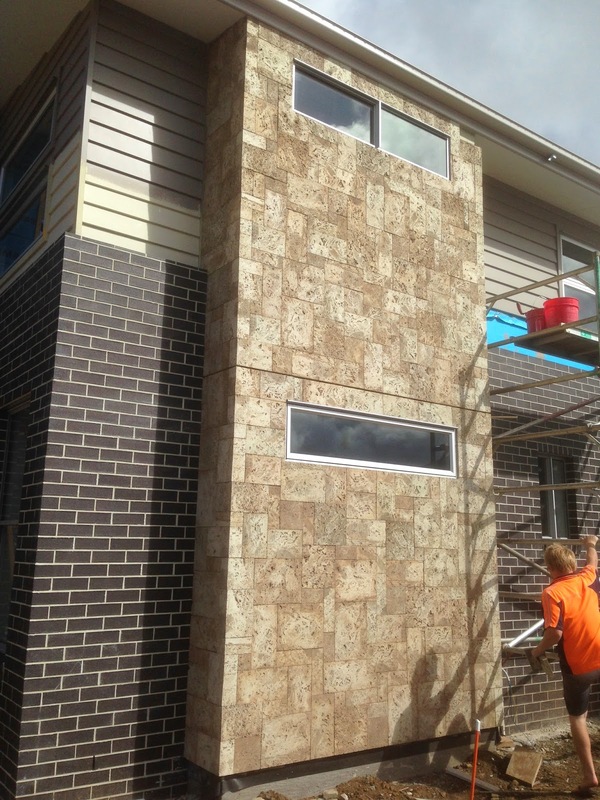 The stone used on this facade is Eldorado, Coastal Reef. Contact us for more information on MVIS products, by calling your local LATICRETE Technical Sales Rep on 1800 331 012 or email us here. 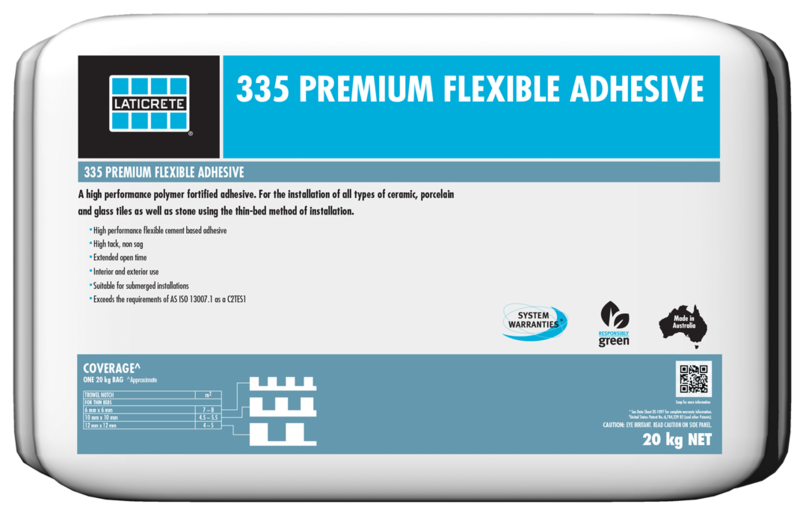 In keeping with the Global design, we have recently updated our 290 Super Floor & Wall Thin-Set Adhesive bag. 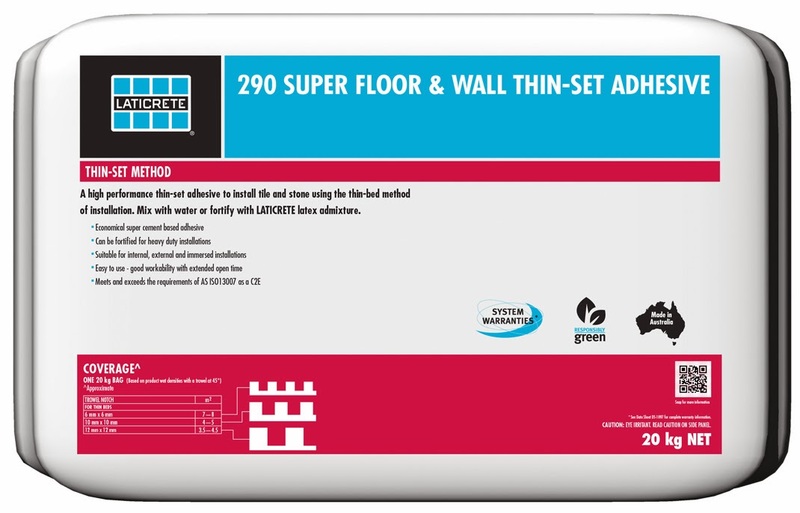 290 Super Floor & Wall Thin-Set Adhesive is a high performance thin-set adhesive to install tile and stone using the thin-bed method of installation. Mix with water or fortify with LATICRETE latex admixture. Click here for more information. Keep a look out for our new bag! Contact us for more information about LATICRETE products or speak to your local LATICRETE Rep about your next project, by calling 1800 331 012 or email us here. A Trailer Awarded to the Top Tradie! A Trailer - What a Great Prize for a Tradie! winner of the Homesglen Apprentice of the Year, for Ceramic Tiling. 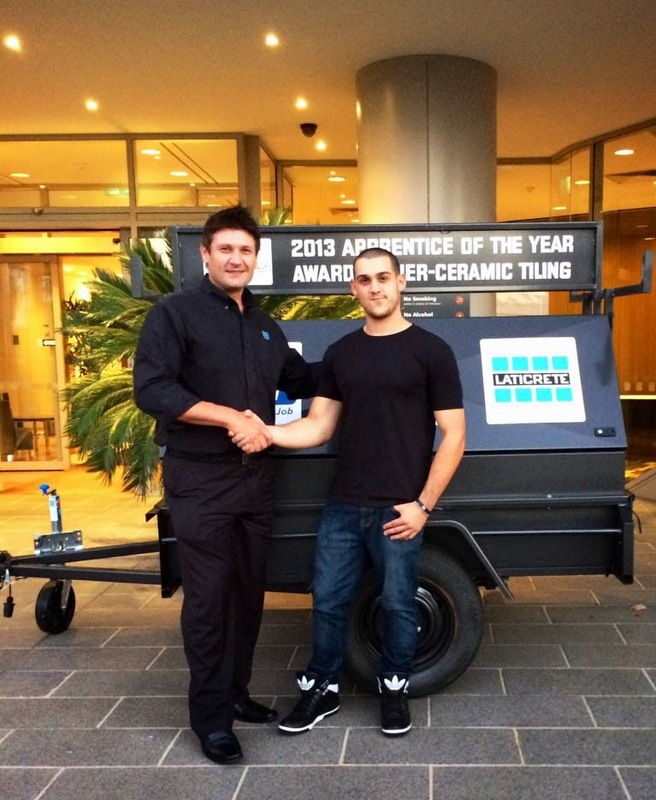 The 2013, Homesglen, Ceramic Tiling Apprentice of the Year winner, Sam Cavallo as in the photo above, with LATICRETE Technical Sales Rep, Alex Kralefski. Well done Sam! Holmesglen is the most comprehensive provider of building courses in Victoria. The building and construction courses range from pre-apprenticeships and apprenticeships, through to diplomas, advanced diplomas, building degrees and postgraduate studies. Pathways are available to get started at an entry level, whilst many of the higher qualifications allow for direct entry from professionals with prior experience in their industries. For more information on Homesglen and the available courses, click here. Profit Through Knowledge Seminar in Noosa, QLD. Great opportunity for you to attend the Profit Through Knowledge Seminar on the Sunshine Coast tomorrow, Tuesday, 25 March! 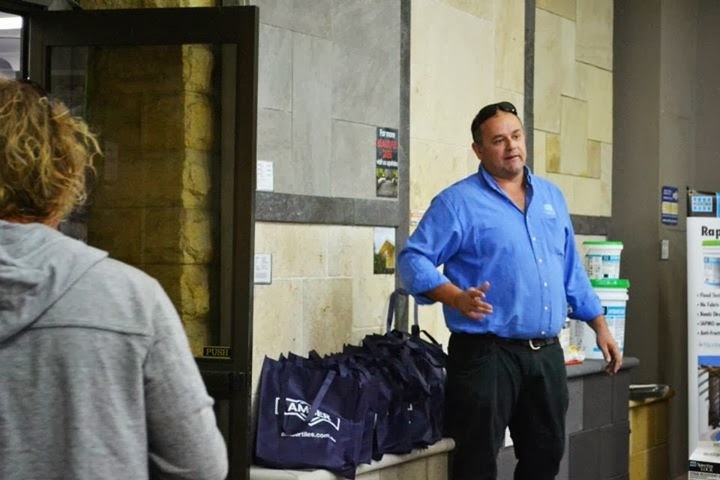 LATICRETE Technical Sales Rep, Reuben Craig and the LATICRETE Technical Service Manager, Fred Gray will talk about products that are designed to save you time and money. Chat to Adam Marks, LATICRETE National Sales Manager about LATICRETE Systems and Warranties. Learn about LATICRETE products that are used in various job site installations. 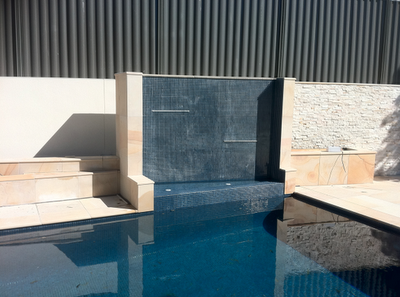 Discuss industry standards for swimming pool tiling and mosaic installations. 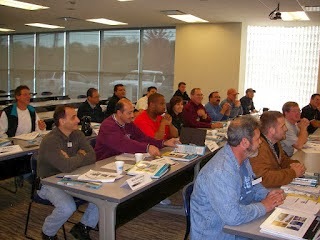 Discuss concrete construction and moisture related issues in concrete. Up-selling to increase performance while lowering customer complaints. Job site visits and forensic examination. Contact us on 1800 331 012 for more details, or email us here. Have You Seen this GREAT Promo?! So what's the promotion then? Click here for the LATICRETE Stockist promo. This Great Promo runs until 30th May 2014! Welcome on Board Team LATICRETE, Michael! LATICRETE Australia, Production Manager, Jamie Young is pleased to announce the addition of Michael Hetaraka to the Virginia, QLD facility. 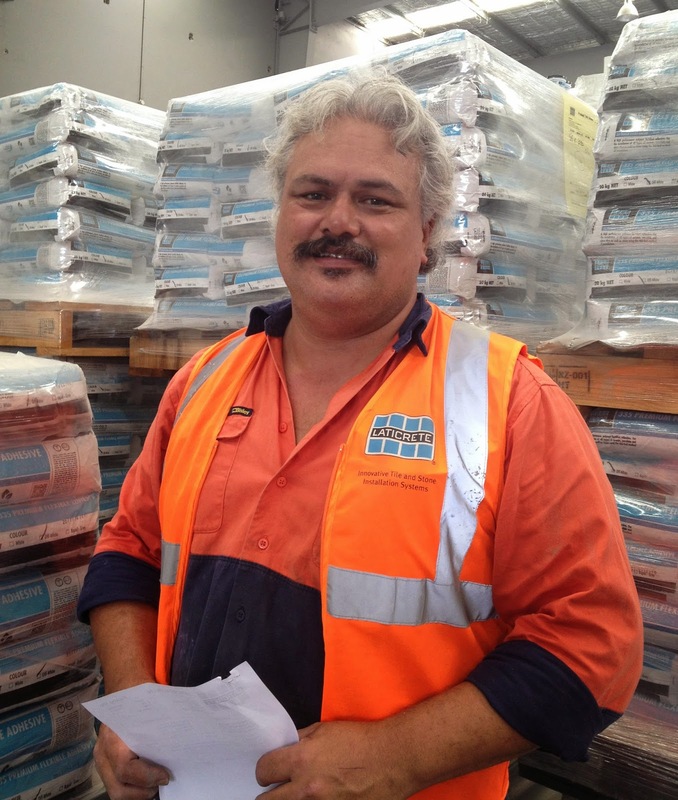 Michael joins our Team as our new QLD storeman. Michael comes to us with experience in distribution, inventory management and inwards/outwards freight. Michael lives in Brisbane. He enjoys football, fishing, socialising and is family orientated. We are very excited to have Michael on board Team LATICRETE! 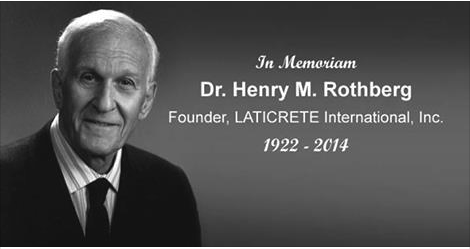 With the passing of our Founder, we revisit the accomplishments, vision, commitment and legacy of Dr. Henry M. Rothberg. In 1956, North America was in the midst of the largest building boom the world had yet seen. Post-war prosperity drove home ownership and new housing starts to unprecedented heights. President Eisenhower’s most notable accomplishment, the Interstate Highway System, was just beginning to take form. Cities from coast to coast were being expanded and reshaped. The American landscape was about to change forever. New technologies were emerging in almost all trades and industries, and construction was no exception. Mass production techniques were applied to homebuilding and thus in Levittown PA, the “Planned Community” was born. Improvements in steel engineering allowed for taller, lighter structures. Commercial and office building construction took off after decades of stagnation. Despite vast changes in many construction trades, ceramic tile and stone installation practices remained virtually indistinguishable from 100 or 1000 years prior. Four basic ingredients were required: sand, cement, water, and a lot of labour. A thick bed of heavy mortar was required to place tiles or stones on walls, floors and counter tops. Difficulty in aligning with adjacent finishes meant expensive changes to framing and concrete placement details. The resulting installation was massive and heavy in a time when buildings were designed to be lighter in weight and more flexible. All of these factors conspired to limit acceptance and use of ceramic tile. It was used primarily on bathroom floors and walls and on ground level lobbies and kitchens. Total consumption of ceramic tile in the United States in 1955 is estimated at less than 100 million square feet – or only about 0.6 square feet per capita. The landscape of the ceramic tile industry also was about to change forever. While working in his family’s floor covering installation business in South Carolina, Henry M. Rothberg realised that there must be a better way to install ceramic tile. With a background in science and a degree in Chemical Engineering, Dr. Rothberg began development work with Uniroyal Chemical at their Naugatuck, CT research facility where he investigated synthetic latex technologies that had been applied to the concrete industry. After much effort and time – LATICRETE 4237 Latex Thin-Set Additive was developed and taken to market. 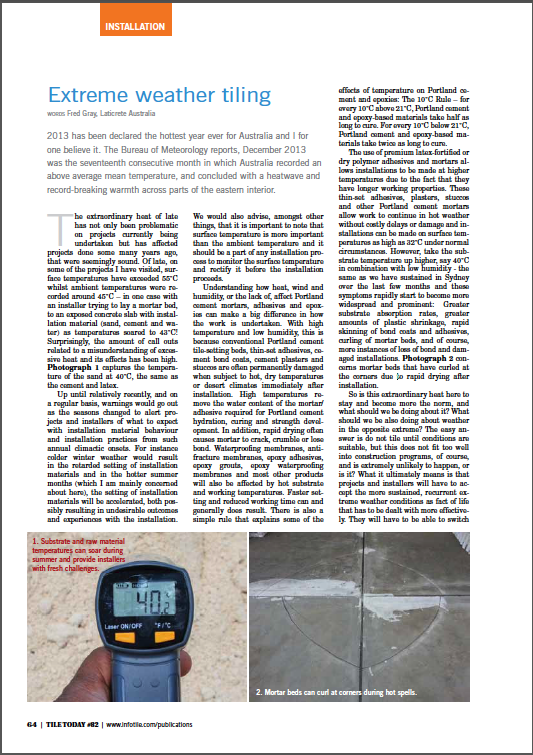 For the first time a strong, weather and shock-resistant “thin-bed” mortar could be mixed on-site using equal parts of sand and cement, gauged to a workable consistency with LATICRETE 4237. In 1956, not realising the potential of what would soon prove to be a revolutionary product, Uniroyal sold the LATICRETE brand to Dr. Rothberg, and LATICRETE International, Inc. was born. Initial efforts to promote this new method of tile installation in North America met with resistance. LATICRETE became one of the most prominent product lines available as tile distribution developed around the world in the 1960’s and 1970’s. As distribution increased, so did the availability of LATICRETE. More and more products were added to the LATICRETE product line that allowed installation of ceramic tile in residential and remodel applications as well as in industrial and commercial construction. LATICRETE became a brand preferred by many types of installers, not just large installation firms focusing on large projects. Demand for LATICRETE® products is fulfilled through distribution supported by 6 plants in North America, and a network of factories, distributors and partners around the world. In the 1990’s LATICRETE sharpened its focus on the international market to create and cultivate efficient local production in expanding markets. This successful strategy has resulted in worldwide local availability of LATICRETE installation materials. LATICRETE continues to add focus on adding value to the markets it serves, and thus those markets grow in value for all participants. Always driven by the desire to innovate, LATICRETE has pioneered dozens of industry firsts in products and services. By specialising in the development of products designed for the installation of ceramic tile and stone, a singular focus has been achieved that continues to bring forth products that make tile more durable and economical in virtually all types of applications and climates around the world. Our commitment to innovation continues today and will continue into the future as we pursue the vision of our founder, Dr. Henry M. Rothberg. 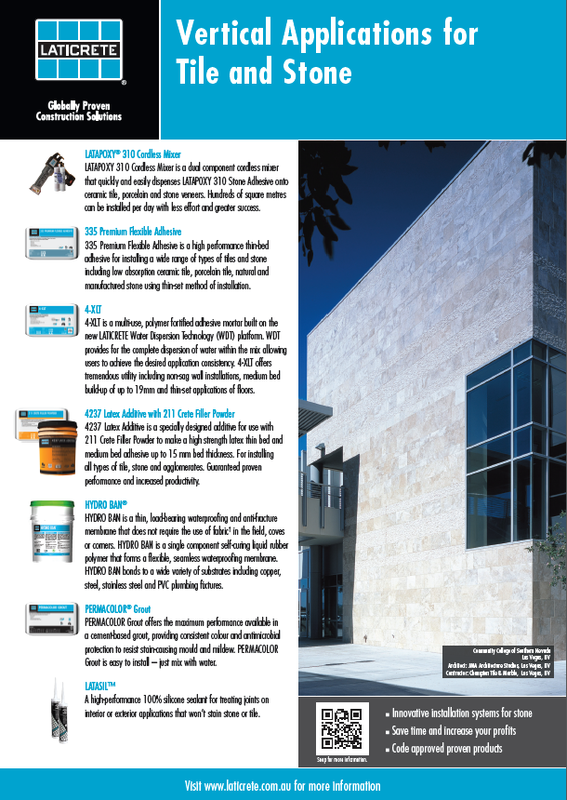 Click here to read/download the brochure on the History of LATICRETE. A guest book has been created for those who wish to share their condolences with the family. Seminar on the Sunshine Coast - Save the Date! Great opportunity to attend the Profit Through Knowledge Seminar on the Sunshine Coast on Tuesday, 25 March! 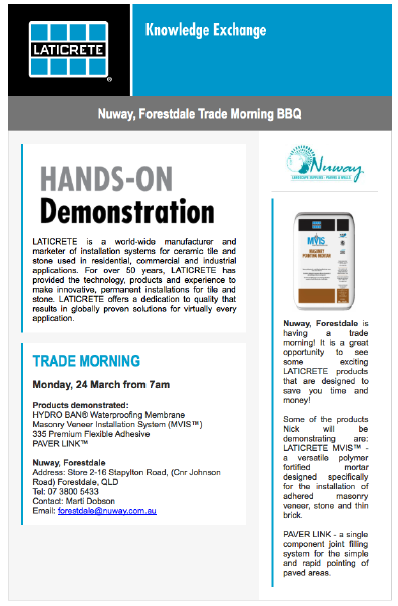 Nuway Forestdale is having a Trade BBQ Morning, Monday, 24 March 2014, and would be delighted if you could attend. This will be a great opportunity to talk to your local LATICRETE Technical Sales Rep, Nick Collett, about products that are designed to save you time and money. Talk to your local LATICRETE Technical Sales Rep, Nick, to get your LATICRETE REBATE COUPON! Conditions apply. LATICRETE products are designed to save you time and money! Amber Mittagong is having a Trade morning, Friday, 21 March 2014, and would be delighted if you could attend. This will be a great opportunity to talk to your local LATICRETE Technical Sales Rep, Glenn Mannix, about products that are designed to save you time and money. 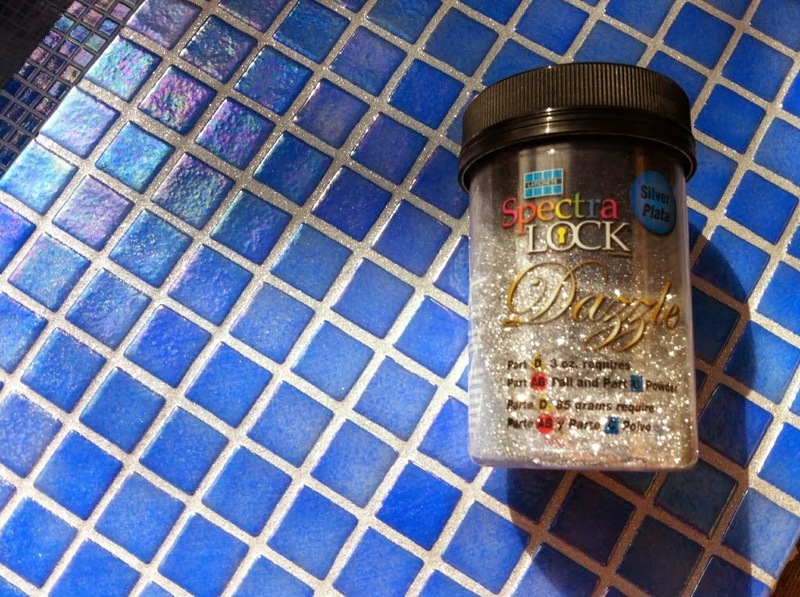 SPECTRALOCK® PRO Grout. This is a stain-proof grout that is EASY to install - the perfect solution for an industry wide problem! HYDRO BAN® Waterproofing Membrane will also be demonstrated. Talk to your local LATICRETE Technical Sales Rep, Glenn, to get your LATICRETE REBATE COUPON! Conditions apply. Amber Tamworth is having a Trade afternoon, Wednesday, 19 March 2014, and would be delighted if you could attend. This will be a great opportunity to talk to your local LATICRETE Technical Sales Rep, Glenn Mannix, about products that are designed to save you time and money. HYDRO BAN® Waterproofing Membrane being applied to the walls. 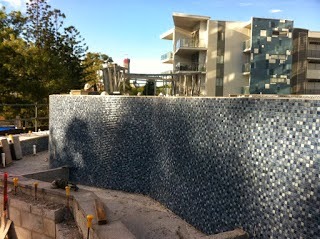 LATICRETE Full Pool Tiling Installation System Going in on this Project. Another full LATICRETE pool spec going in on this 120m2 pool, in Red hill, Brisbane. Rogers Pools are the installers. More photos to come as it progresses. HYDRO BAN® - click here for more information. 4237/211 - click here for more information. With a LATICRETE® System Warranty you can enjoy peace of mind with high-quality, world renowned LATICRETE products. When selecting the installation system for your project, consider the value and peace of mind that a LATICRETE warranty can bring. Contact your local LATICRETE Technical Sales Rep to discuss your next project or email us here. LATICRETE offers a wide range of proven solutions for interior or exterior tile and stone installations in both residential and commercial applications. The LATICRETE System is designed to increase your productivity and increase your profits while protecting your name and reputation. Put your trust in the leader with over 50 years of experience - LATICRETE. Click here to view/download this brochure. Contact your local LATICRETE Technical Sales Rep and discuss your next project. Call us on 1800 331 012 or email us here. Amber Fairy Meadow is having a Trade BBQ Morning, Wednesday, 12 March 2014, and would be delighted if you could attend. This will be a great opportunity to talk to your local LATICRETE Technical Sales Rep, Glenn Mannix, about products that are designed to save you time and money. Contact us to for more information by calling 1800 331 012 or email us here. 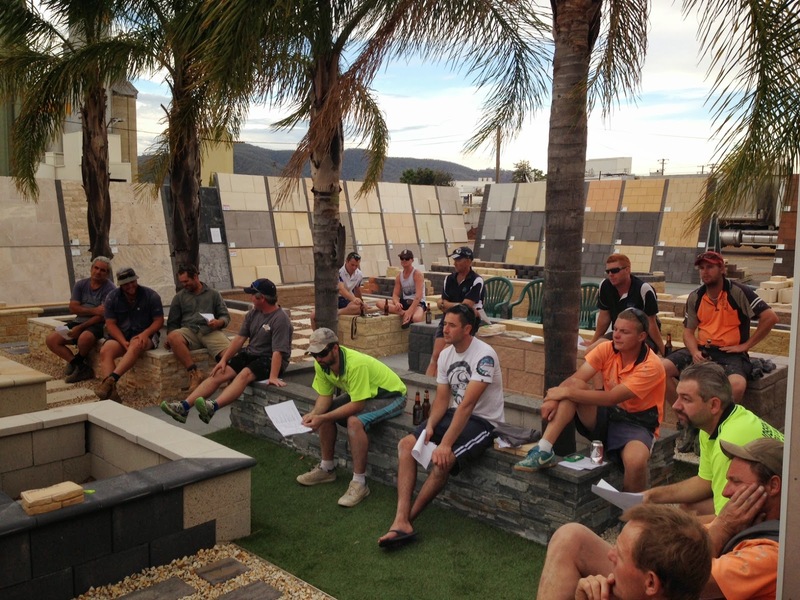 Tradie Event @ ColorTile Dee Why, Today!!! Will You Be There Today? We encourage you to join us for an educational demonstration regarding Making More Money & Preventing Grout Problems ! This event will be well worth your attending. 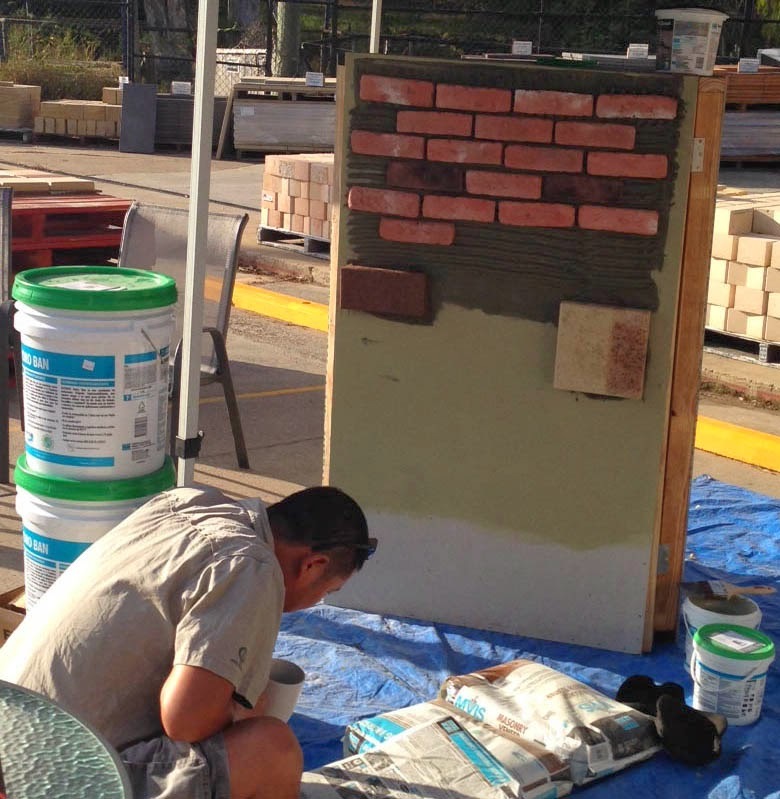 View and take part in a hands-on demonstration of SPECTRALOCK "StainProof" grout. Available in 40 colours with design options of metallic Dazzle accents and "Glow-in-the-Dark". Talk to your local LATICRETE Technical Sales Rep, Joe, to get your LATICRETE REBATE COUPON! Conditions apply. 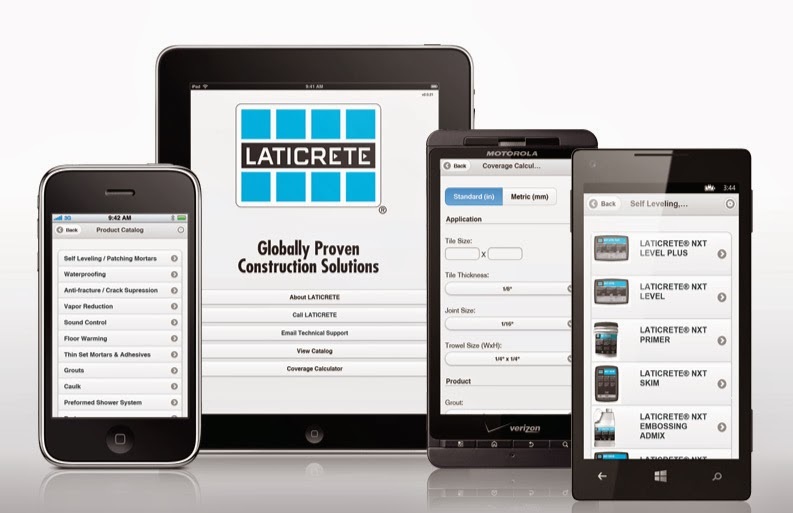 Have You Got the LATICRETE Mobile App? LATICRETE at your Finger Tips! Labels: coverage calculator, LATICRETE Mobile App, Product Selection Catalogue. "2013 has been declared the hottest year ever for Australia and I for one believe it. The Bureau of Meteorology reports, December 2013 was the seventeenth consecutive month in which Australia recorded an above average mean temperature, and concluded with a heatwave and record-breaking warmth across parts of the eastern interior." For Technical support email: techsupport@laticrete.com.au or call 1800 331 012 and speak to your local LATICRETE Technical Sales Rep about your projects and our products. Wanna Know More About "StainProof" Grout? 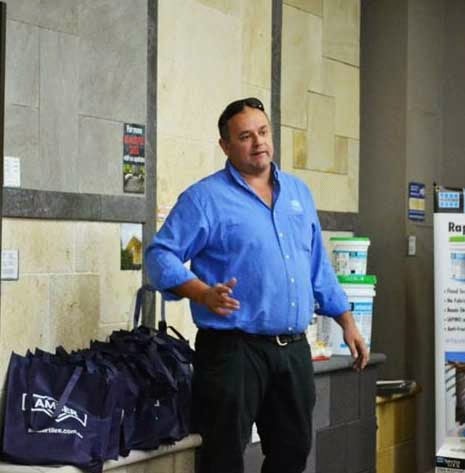 Your local LATICRETE Technical Sales Rep, Joe Tabone, will be at ColorTile on Friday, 7 March from 4pm demonstrating HYDRO BAN® waterproofing membrane and SPECTRALOCK® PRO Grout, the "StainProof" grout! Talk to your local LATICRETE Technical Sales Rep, Joe on the day, to get your LATICRETE REBATE COUPON! Conditions apply. A Product for Floors, Walls & Even Pools! Click here for more product information. Click here to view/download the Warranties Brochure. Yes, 335 is on the list of available System Warranties! Including the Swimming Pool System Warranty. Wonder what our March promo is?? LATICRETE Stockists, wonder what our March Promo is going to be for you? Click here to view the promo. 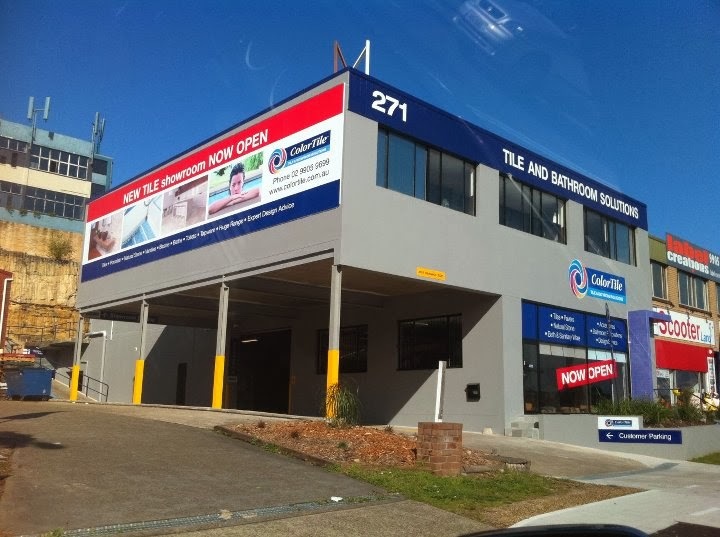 Tile Contractors - click here to view the MARCH promo. Call 1800 331 012 to speak to your local Technical Sales Rep or email us here for more information.